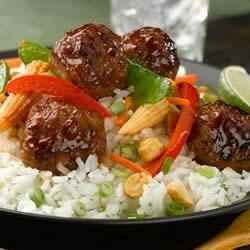 "Teriyaki meatballs, combined with stir-fried vegetables are served over rice in this Asian-inspired main course." Prepare a large skillet with cooking spray and olive oil and heat over high heat. Saute the carrots and pepper 1 - 2 minutes. Add the al fresco all natural Teriyaki Meatballs, and brown on both sides. Add the snow peas, saute an additional 2 minutes, then toss in the scallions and add the teriyaki or hoisin sauce. Reduce heat and cook 1 - 2 minutes. Serve over the Basmati Rice. Ingredient Note: Substitute 1/2 cup light coconut milk for 1/2 cup water when cooking rice, grate in zest of 1/2 lime for a nutty fragrant basmati rice. Optional Garnish: Add baby corn if desired and serve garnished with dry roasted peanuts and fresh mint. This is really good! I added a 16 oz bag of frozen Sugar Snap Pea stir fry in stead of messing with all the veggies. Worked great. I did make extra sauce. I will make this again! This was very good! The meatballs had a great flavor. I did omit the carrots...just personal preference. Will definitely make this again! I made this for my teenage sons and it was gone in a flash. Simple and absolutely delicious!